With an uncle and cousins who were chiropractors and an osteopath grandfather, Dr. Owens grew up around natural health disciplines. “It intrigued me that they worked with the body to get people well, relieving all types of sickness without the use of drugs or surgery.” He wanted to help others enjoy their body’s full healing abilities and decided to become a chiropractor. 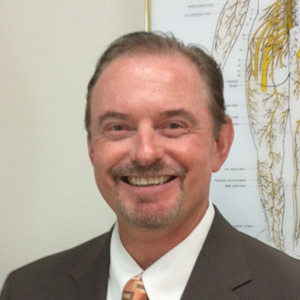 Dr. Owens attended Cleveland Chiropractic College in Kansas City, Missouri. There, he learned several different adjusting methods, including the Thompson Technique. He often utilizes this method today as a diagnostic tool that indicates precisely where an adjustment is needed. He holds additional accreditations in extremity adjusting and the treatment of sports injuries. A family practitioner, Dr. Owens sees moms, dads, kids, grandmas, grandpas, uncles, aunts and more. He also works with athletes and does Kinesiology Taping. Dr. Owens’ dream was realized when Health Quest Physicians Group expanded into a multispecialty practice. “Patients can come in with any problem or ailment, and we can handle it with our many solutions. We have a one-stop practice where people can have all their health care needs addressed.” In his spare time, Dr. Owens enjoys golf and being outdoors, as well as trout fishing. He and his wife Jackie have four children: Drew, Joshua and twins Sam and Anna. They all enjoy taking a family vacation every year to Branson, Missouri. Contact us today to find out more or to schedule your appointment! Insurance coverage can be used for your visits.